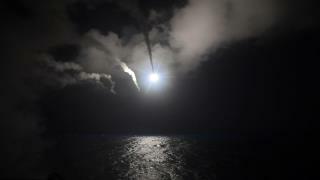 (Newser) – After President Trump's strikes on Syria this week, praise from the usually antagonistic media "flowed like wedding champagne," Margaret Sullivan writes for the Washington Post. It poured in from CNN, the New York Times, the Wall Street Journal, and MSNBC. Trump "became president," followed his "heart," and did "the right thing." Brian Williams seemingly couldn't restrain himself from marveling at the "beautiful" attack. All of which led Sullivan to ask: "Are we really doing this again?" It was only the media who suddenly thought the minoirity President looked presidential because he bombed someone. All the Republicans in Congress who were opposed to bombing Assad when Obama asked for authorization are now suddenly singing a different song-"look how strong he is, how quickly he responded- a totally presidential thing to do." What they fail to take into account was that in typical fashion the Minority President saw something that upset him on TV and he reacted immediately- with bombs instead of tweets because Assad probably isn't on twitter. Now what happens? What is the next step? Was this a one off- which didn't even stop planes from flying out of the bombed airport? Will he ask Congress to authorize his actions or will he also try to expand his war powers even though Syria was not part of the original war powers act. Now we have a president who seeks praise constantly. He has received a good deal of it for dropping bombs on someone- who definitely deserved it but the question remains will he repeat the process whenever he needs another ego boost or to deflect from unfortunate leaks from his WH? This is a very dangerous precedent to establish especially with this president who keeps having election rallies whenever he has a bad week. The media's reaction is not news. Trump was wrong to attack a country. You,We, America, cannot attack a country because it was sad, Sad! The media didn't make a big deal about this... Nor did any of the liberals... Among other things, President Barack Obama did while in office: Sent 3,500 U.S. troops and tanks to Russia's doorstep in one of his final decisions as president. Obama ordered ten times more drone strikes than Bush. In 2016 alone Obama dropped 26,171 bombs (an average of 72 bombs every day). Put boots on the ground in Syria despite 16 times saying "no boots on the ground". Despite campaign pledges,planned a $1 trillion program to add more nuclear weapons to the US arsenal in the next 30 years. Dropped bombs in 7 Muslim countries; and then bragged about it Said, “I believe in American exceptionable with every fiber of my being.” Bragged about his use of drones -"I'm "really good at killing people". Signed the Monsanto Protection Act into law. Started a new war in Iraq .